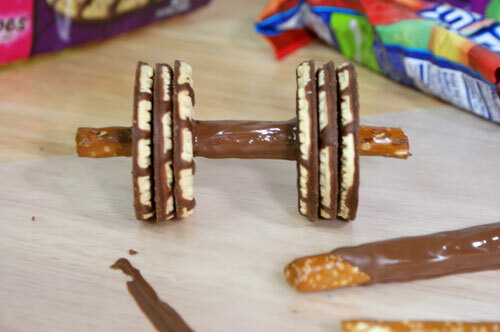 I know what you’re thinking right now… whenever I step foot in a gym and see weights, I think of cookies and chocolate dipped pretzels. 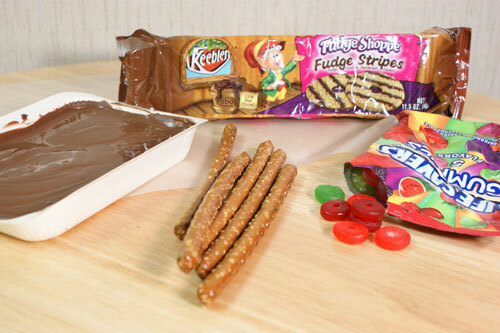 Not entirely true… but this combination of fudge stripe cookies, pretzel rods, and gummy savers just happen to fit together perfectly. I will admit though, since becoming more involved with food and developing creative treats I look at everything differently. You (as in, me) start thinking of what candies could become a nose, what you could use to make as legs for a cake pop turkey and other strange stuff. Example: last year I made pretzels into cigars (perfect for Dad). Here is something else I know Dad would enjoy and I’m sure you wouldn’t mind either. Break the ends of the pretzel rods off, so that each rod is approximately 5-6″ long. 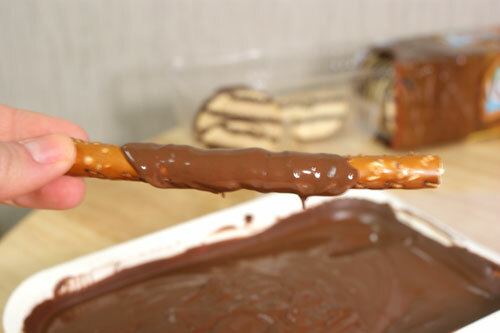 Spoon chocolate CandiQuik over the center of each pretzel rod, leaving about the last 3/4″ on each end uncoated. Slide 3 cookies onto each end of the pretzel rods, set on wax paper to dry. The coating will help the cookies stay in place (so do this while the coating is still wet). Stretch out the Gummy Saver candies in order to slide onto the ends of each pretzel rod. 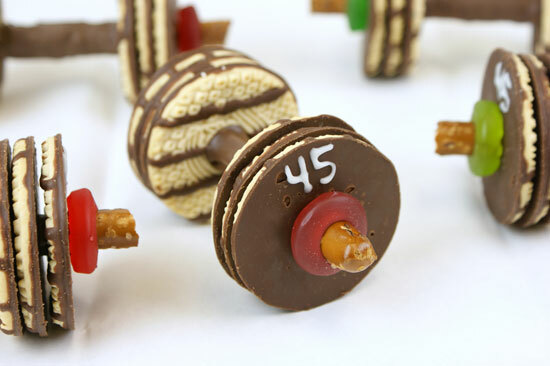 Now, if you want to add numbers to your weights it adds a little something and makes them more definable. 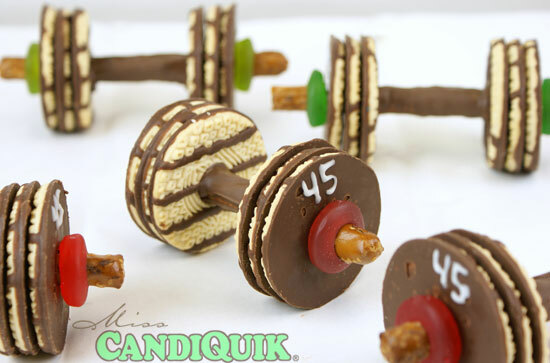 To do this, I just melted down a couple ounces of Vanilla CandiQuik and used a toothpick to draw on the “45″ – clearly these are macho man barbells. How easy was that!? These would be great for an Olympic themed party as well. 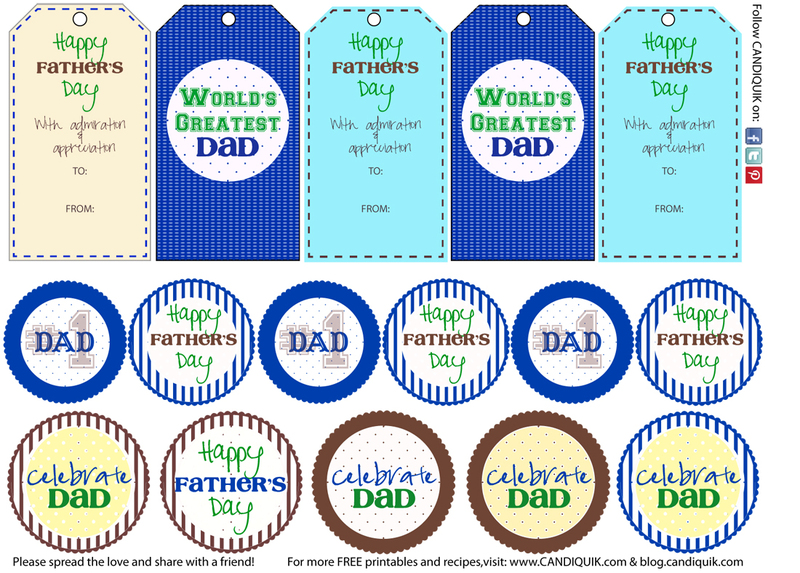 Happy Father’s Day to all the wonderful father figures out there! Love these. 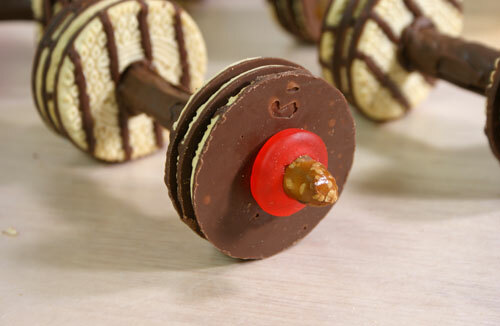 If I eat them does that mean I’m lifting weights, lol? Thank you, Winnie! Have a great day. Totally adorable and so creative. Love! Those are seriously adorable!!! I love that you look at food differently too…makes me not feel so crazy for all the stuff I see differently now!! I am having troubles with the cake balls:( I cannot seem to get them to roll into ball form:/ Help! Hi Karissa, I have a tutorial on common cake pop problems, check it out here: http://blog.candiquik.com/?p=3020! This should cover all of your questions/issues. Hi Lynn – aren’t they adorable!? Thanks for stopping by! My husband caught a glimpse of these and loved them! 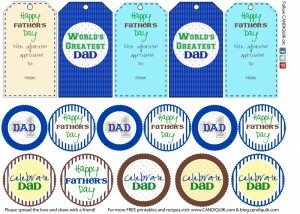 Looks like these will be in my near future, pinning right now. Thank you for sharing at #GetHimFed Fridays, would be great to see you again this week!